Hi Laura. First let me say, thank you for the lovely video tour of your tiny home which you have shared here. Your place, the setting, it all looks very enchanting! 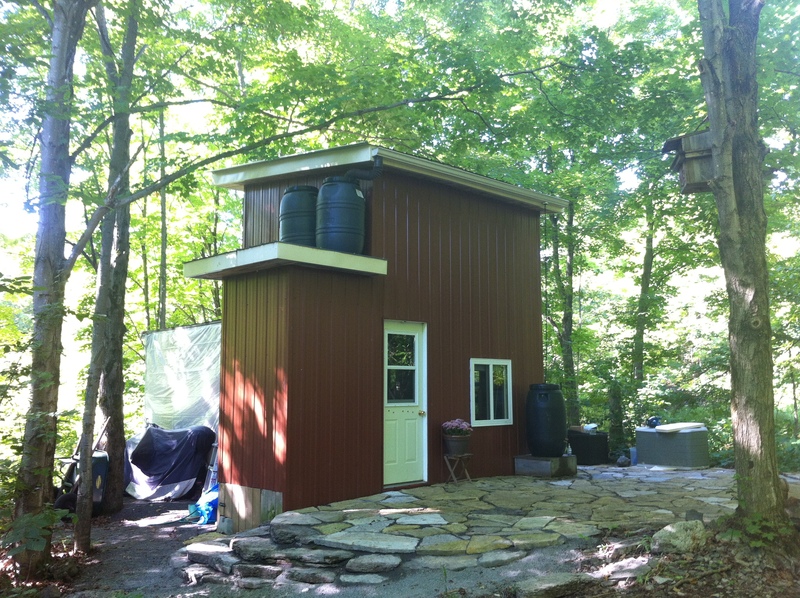 I have been pondering the idea of a Tiny Home over this past year, and just recently started to poke around the web to research what is involved. I have been reading your blog for the past week or so, and I must say, you have one of the most informative sites around. I too am living here in Ontario, and I mistakenly thought I could buy some cheap land, perhaps towards the outskirts of Selkirk,and park a tiny home there! My little fantasy was squashed in reading the by-law information. Then I came across the website of the first Tiny Home community in KIngston, but I see here in your blog that you also mention that site, and that you are skeptical, believing it to be a scam. How disappointing if that is the case. Wondering if you have some personal knowledge regarding it? Certainly, when you really have a good look at the site, it seems sketchy and the fact that they want you to provide detailed personal information so they can “research” your details, just didn’t sit right with me. A few questions for you, since I haven’t yet been able to read every single blog entry you have provided. Was your tiny home built by a company here in Ontario? Was it prefab, or did you do it “from scratch”?. Are the by-laws different with regards to the toilet issues if the house is mobile, on wheels? I am leaning towards a house on wheels, and particularly one without a loft, since I am thinking this might be something I want to do once I retire in approximately 7 years. I can’t imagine myself going up and down a ladder or tiny house stairs. Do you have any practical advice for me with regards to how I should approach my research on Tiny Home living here in Ontario? I thank you kindly, in advance. And I look forward to pondering over the rest of your blog entries, past and future. ~ Lorelei. P.S. Your tiny fur babies in your tiny home are adorable! Thank you Lorelei, I am glad that you enjoyed it! I don’t like to be negative, however, I do fear that people are being scammed. Regarding the so called tiny house community in Kingston, there have been many who have reported concerns to me. They want a lot of personal information from you and money up front before they give details… And if this is not disturbing enough, further to this, I believe the person who started it, is a ne’er-do-well named Wayne who was so creepy with me on here that I had to hire a detective to find out who was harassing and threatening toward me. Need immediate answer if possible — May we make appointment to visit Tiny Home Ontario Kingston community? We are interested in supporting tiny home communities across Canada. We have nearly completed our tiny house plans and we are visiting Kingston area ths week (Sept 21-25). Is it possible to visit the Kingston community? Thank you for any info. There is NO tiny house community in Kingston Ontario Canada. I expect you mean the so called SMART COMMUNITY – which is, in my opinion a scam and I am so sorry that I am again being mistaken as being a part of this. I can assure you that I have absolutely nothing to do with it. If you look on my Facebook wall https://www.facebook.com/TinyHouseOntario?fref=ts you will see that this question comes up a lot and I always tell people the same thing that I have said here. Again, I think it is a scam. While there are three tiny houser in the Kingston area, that is to say, two that are being built and mine, these are all private homes and not opened for tourists. While I encourage your move to the tiny life, you will understand when you have your own tiny house (particularly if you blog and have thousands of followers) why I decline these visits. You see there are hundreds and hundreds of people who invite themselves to visit my home: plus there are dozens more annually who want to interview, write stories about, make videos, radio interview and make films about and simply put, it is not my cuppa tea. There are lots of tiny housers who have places on wheels and they choose to invite people in during home shows, tiny house events and the like but to every one of them there are dozens of people like me who enjoy varied degrees of privacy in their homes. For me… who started this blog only to share with my friends and family what I am up to, the number of followers is a complete surprise. Largely it is really nice. But saying no, to people is not my strongest skill… and I feel badly. Still, largely, I am a woman who is there often alone and the privacy that my little world affords me – is both welcome and needed. I am however, really sorry to disappoint. Kind regards and please do keep me in the loop if you go ahead with your build. Hi Laura. I understand the need for privacy. I live in an unusual setting and house (not a tiny house – that’s next) – even trades people and people coming to buy something I’ve sold on Kijiji want a tour and to look around. Soemtimes I find them wandering on my property without my permission….it’s an invasive feeling though I appreciate that they’re charmed by my location and home. I am single so a little wary too. I am reaching out tentatively into this idea but hear contrasting things about tiny houses – not sure I could live in one just 8 feet wide….so I am curious about the size of what youve built and how much space and the design you chose to go with. I’m thinking I could manage 400 sf, but below 300 I think I’d be claustrophobic….having not seen any in person – just on the TV show and the odd photo here it’s hard to get a sense of waht it feels like “in” one. Hi, My house is 93.97 square feet inside plus the half floor loft that is the same size and a 12.25 square foot in-house. The reason that I went this small is because it was the only way to get around the building code. Every municipality is different in Ontario and my particular one allows either a 1500 square foot minimum or a 108 square foot (footprint) on undeveloped land. THO fits just inside of the minimum, because out-houses (in my case an in-house) do not count and the house itself is just under the minimum in terms of footprint and height. I aimed to build a 300 square foot straw bale, originally… but given the codes, I was pickled and had to go the way I did. If you are going to build tiny… you must have a lot of windows. So that your living space feels like it is open to the outside. My house feels calm and peaceful inside and fully connected to its surroundings. Kind regards and keep me posted as you enter your journey! Although I’m certain being a country girl , you already know all about these things :). Such a wonderful job you’ve done on your tiny abode. As we were brought through the tiny house it appears to be larger than it actually looks from the outside. The stone patio is lovely, such a beautiful spot to sit and enjoy nature, how blessed you are Laura. Working with stones and gravel can be back breaking as I well know, being an avid gardener myself. There are so many lovely shade flowers you could plant around the tiny house as well as some herbs that enjoy shade. Shade loving Canadian cacti, you are funny LOL! Would you mind giving me the names of the perennials you have planted? There are a lot of wild things already in the area where I really want to have all in flowers and lots more that are in the forest surrounding. Such as trilliums, nodding wake-robin, ginseng, wild ginger, bellwort, false solomon’s seal, trout lilies, may flowers, hepatica, blood root, canadian anemone, sacred & magical flowers (geranium robertianum), violets and a bunch of others that are less showy. Sadly – there seems to be no jack in the pulpit, blue bead lily, ladies slippers or other orchids that I have found. I planted astalibe, a few varieties of hostas, bleeding hearts, lily of the valley, dutchman’s breeches, Gout weed (which does not take hold!!!) I also tried some iris and strawberries along the more sunny edges, by the solar panel and some herbs too. The strawberries are too yummy to do well… the iris don’t bloom at all. I was hoping to put in some flocks and maybe some hellebore, or yellow wax bells next year. Any suggestions? You certainly know your wild flowers lol, we have all of those as well. I adore wild flowers. The trilliums are unbelievable in the spring! Do you have lots of fireflies (fairies) there Laura? It’s my bedtime now and I’m pooped lol, although I will get back to you regarding the flowers Laura. Have a good night Laura. Yes! Millions and millions of them! Sadly I missed the heavy firefly season the last two summers. Next year though! I would really love to have someone with a good camera video this. It really is magical! I too am pooped! There was a lot to do today. Have a good night’s rest. If the grounds around the house are consistently moist there are a few hardy shade plants that you could try. Variegated or light colored foliage plants are very nice in the shade such as variegated ajuga with the added benefit of blue flowers. Japanese Painted fern is very easy to grow and is so pretty planted with hostas, such as the the Krossa Regal, it has very showy leaves in a blue gray color. I have the Japanese Painted fern which is beautiful. Oh yes, then there are bleeding hearts that come in different colors, I particularly like the white ones because they glow in the dark which any white flower does. Columbine is so pretty too, it comes in so many different colors, beautiful foxglove and Japanese anemone. These are are perennials of course. but for them to flourish in shade, you need to make sure they stay consistently moist. Any of these plants could be started in bigger pots or buckets and left outside for the winter, and when you go to Tiny House in the spring and they begin to come up you could transplant them to your gardens. Normally I will buy one plant and then wait for a few years to break it up and transplant. Do you know what type of soil surrounds your TH Laura? Yes, I am concerned about this. The non natives that I have selected are not ones that will easily spread with the exception of goutweed which did not take. I am hoping for florals that will fill the area which is adjacent to the house… My thinking is, a showy floral area that would take up the land space that would be covered by the current sized McMansion. I am certainly going to put in the native Sunflower Helianthus tuberoses (AKA: Jerusalem artichoke) to my vegetable garden next year – where it is sunny. I think they may well survive the critters who search for food. But as for shade… Do you have any suggestions? Great job on the video – enjoyed seeing your little house! Thanks Mary! I don’t know why it took me so long. It was not really difficult to do. It was much more wiggly, but You Tube adjusts this and it does a pretty good job of it. I have long hoped that someone with better camera skills would do this for me. Actually there was a girl from CHCH who came and took hours of film – but the story was not approved by the station and the girl never bothered to put it on line. What a waste of time that was! I am so glad that you like my house! I was up by your place the other day… Saw the hives, but no deer. I would like to be at THO more and supply things for the wildlife as you do. Having animals around is the best, isn’t it? Thank you! Love it all. Very cozy and homey. You’ve done a great job on that patio. I know how labor-intensive it is. I never finished mine, so I reused the stones for something else. I know what it is to have a love affair with rocks..!! What do you do with your water storage tanks when it gets really cold..?? Are you there in the winter at all…?? I forgot to notice if you had a wood stove. I disconnect and drain the water tanks to the faucet in the fall. I leave the water in the base to freeze, just for the weight, so that they do not blow down. I visit in the winter. I have a solar heater which keeps the house about 10 degrees warmer than outside. I think it will be even better this winter now that I have installed in an insulated floor. I have been using propane to heat it up more, but this is such wet heat… and I do have a wood stove… BUT I have not been able to connect it due to the health issues. I am hoping that I can get some help with it, this year and have it in very soon. Wonderful! Thanks for sharing it. Have followed you for years. Really enjoyed the tour and meeting your family. Had a chuckle when you said it was hot as I used to live in New England but now live in Western Australia. I do remember the ghastly humidity though. Beautiful spot. Brought lots of memories back of the place by parents built on Cape Cod, little by little, starting when I was 8…..a tiny house that grew and grew as they turned it into their retirement home.